Newcastle United’s managing director Lee Charnley is sitting in the St James’ Park boardroom, exhaling as he answers the apparently simple question: what would have happened? Charnley later adds “catastrophe” and “bloodbath” as he explains the potential consequences if Newcastle had failed to win promotion from the Championship at the first attempt, following relegation in May 2016. It is a muggy day and a window is open on the fifth floor of the stadium. A noisy police siren whizzes past, as if for effect. There are few secrets this football club can keep from its people, but the size of the gamble to return to the Premier League at the first attempt is perhaps one. The conversation between Charnley, Rafa Benitez and Mike Ashley on the final day of the 2016 season when Newcastle had been relegated has also not previously been revealed. “Mike obviously came to the Tottenham game and that game was really odd,” says Charnley. “Everything should have been negative around the club. It was surreal sitting there and beating a team going for second place in that atmosphere. “Mike and I had been talking throughout the game, assuming we could get the manager to stay, and if we could get off to a decent start you will know what this place is like, you build this momentum and it can develop a life of its own. It is now known that Newcastle did a U-turn. Money was spent, 12 players arrived, expensive sales took place, and only in the club’s accounts for that period, released last week, comes the extraordinary detail of the level of commitment to promotion. The player wage bill alone was £80.3m. Huddersfield went up on £21.7m. “It was a one season gamble because in terms of what we did, it was not sustainable, either from a cash point of view and also from a financial fair play point of view,” adds Charnley. “You cannot operate a business that continually has a wage bill that is higher than its turnover. What would have happened if we had failed to get promoted? It would have been a catastrophe, a bloodbath. “I likely think the manager would have gone. I’m not saying that would have necessarily been our choice, but his as well. For him this was a one season gamble. Charnley talks through deals in detail. Newcastle received £30m for Moussa Sissoko and £25m for Gini Wijnaldum that 2016 summer, but the structure of those deals was complicated. The Sissoko payment from Tottenham was spread over five years and the initial payment for Wijnaldum, from Liverpool, was £5.5m. To Newcastle’s supporters it was £55m in the bank. To Newcastle’s bank manager, it was £11.5m. “The manager did a fantastic job, the players did a great job and the club supported the manager financially in order to achieve that,” he says. “You can see that, in our wage bill and also what we spent. “We did sell players, and we made a profit from those players, but from a cash point of view there was an outlay to us in terms of trading. In Newcastle’s accounts, the net spend on transfer fees, agents fees and the Premier League levy since 1 July 2015 is £100m. Almost £33.1m went on transfer fees alone to sign Florian Thauvin, Chancel Mbemba and Aleksandar Mitrovic in the summer of 2015. 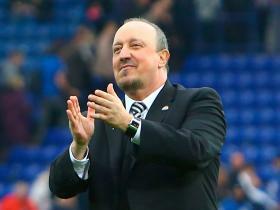 And, following promotion, just short of £50m was spent in buying six players, Jacob Murphy, Florian Lejeune, Mikel Merino, Christian Atsu, Joselu and Javier Manquillo, when the relationship between Benitez and the club became strained. Talks remain ongoing about this summer’s budget, and the possibility of extending the 12 months left on Benitez’s contract. It is at a delicate stage. Charnley will repeat throughout our time together that cash is king. If Newcastle don’t have it, they won’t spend it. The job now is to keep building. “At the beginning of the season did we intend to finish tenth? I think no is the answer. This year was about staying in the Premier League and growing and improving year on year, but doing that within our means. And, perhaps, a new message. £20m was offered to the players to win last season’s FA Cup.